To hide me from the world." It is not easy to reach the Castle from the outside, though the road up Glen Lyon to the Castle is in fairly good condition, and is carried through the locality right on to Logierait in the east. Several of the mountains in the neighbourhood of the glen rise to an altitude of over 3,500 feet, and are familiar to every devoted Scottish mountain-climber. The village of Fortingall is about 13 miles distant from Meggernie Castle, through a pleasant though wild district peculiarly typical of the Scottish Highlands. In very early times the land on both sides of Glen Lyon as far south as Loch Awe, belonged to the MacGregor Clan, and there is every likelihood that the clansmen had a Keep of some kind on the site of Meggernie Castle, as this would command the whole district. The MacGregors claimed to be descended from Alpin, King of Scots, and were sometimes known by the cognomen of Clan Alpin or Mac Alpin. Their motto to this day asserts a lofty origin, as the Gaelic S’rioghal Mo Dhream signifies, "My Race is Royal." The statement has been made that a MacGregor chief built the Castle of Coalchuirn (sometimes spelled Kilchurn) on Loch Awe, but this is not well founded. The clan suffered misfortune at the hands of their two neighbours, the Campbells of Argyll and the Stewarts of Cardney. The MacGregors had been vassals of the Earl of Ross in the time of Alexander II., who reigned from 1214 till 1249, and the Earl bestowed upon them the lands of Glenorchay, at the head of Loch Awe which they had chosen as a residence, and which became their headquarters. The clan became a powerful one, and took a prominent share in the Battle of Bannockburn. But David II., the son of Robert Bruce, forgot his obligation to the Clan Gregor, and deprived them of Glenorchay, which he gave to the branch of the Campbells that had settled at Loch Awe, and the dispossessed clansmen had to retire to the Muir of Rannoch. The policy of the Campbells had long been one of lawless acquisition, and they drove the MacGregors out of Glen Lyon and seized upon their property. The Stewart Kings were equally unjust to this harassed clan, for Robert II., who ruled from 1370 to 1390, confiscated the Keep at Meggernie, which the MacGregors had built and inhabited, and conferred it upon his illegitimate son, Sir John Stewart of Cardney. Thus, with the Campbells on the south of the glen and the Stewarts on the north, the poor clansmen were between two fires, and lost all their possessions in the district. The clan was dispersed and the clansmen became "broken men," dispersed through Perthshire, and long without an acknowledged chief. It is not necessary to pursue the history of this clan further, since it is here shown how they were driven out of Meggernie. Though the exact date of the erection of the oldest existing part of Meggernie Castle has not been ascertained, there is a Charter in the "Register of the Great Seal," dated 4th March 1603, whereby James VI. confers upon Duncan Campbell of Glen Lyon, certain lands which were united to make up the Barony of Glen Lyon, the chief house of the baron being named as "the Tower called Meggernie." The previous Keep seems to have been thatched, but Sir Duncan Campbell put slates on his tower, and it was finished much in the style it now shows. Additions have, of course, been made as the years went on, and there is now a fine modem mansion added to the old building and quite in keeping with it. The walls of the old Castle are five feet in thickness, and have evidently been erected for defensive purposes. There are four square towers, one at each corner, bracketed out from the walls, which give a quaint and ancient appearance to the structure, that is emphasised by the dormer windows with triangular tympanies. As was customary at the time of its erection, there are few windows in the walls, and some of these are only a little larger than old-fashioned arrow-slits. The Castle is five storeys in height. Before leaving Sir Duncan Campbell of Glen Lyon, it may be as well to explain that he was not the first to evict the MacGregors, but he certainly carried on the heartless policy of his predecessors, and left it as a legacy to his descendants. So early as October 1488, the then "Duncane Campbell of Glenurchquha," entered into a contract with Robert Menzies, Laird of Weem, near Aberfeldy, by which they mutually bound themselves to protect and support each other against the MacGregors; and this arrangement was often renewed. Even so late as 1665, when Alexander Menzies of Castle Menzies, son of Duncan Menzies of Weem, was made first baronet, he was married to Margaret, eldest daughter of Sir John Campbell of Glenorchy; and afterwards there were several marriages which linked the two families together. With such strong adversaries against them, it is no wonder that the ancient clan was dispersed and ruined. We’re landless, landless, landless, Gregarach." Their red and fearful blazonry." The curse of Glencoe cleaving to your soul." Glen Lyon survived, and did not expiate the fearful crime he had committed, for he was defended and even thanked by William III. for his deed of blackest treachery and ingratitude. While the historical interest centres in Meggernie Castle, there is much to engage the attention of the visitor in the policies, and in the varied trees with which the place is decorated. This feature is almost entirely due to the devoted labours of James Menzies of Culdares, one of the most competent arboriculturists of his time. Culdares has been in the possession of a branch of the Menzies family from 1659; and it was in 1730-40 that the Laird carried out his great reform of the district by tree-planting. It is said that he was the first to make the larch popular. After passing the Bridge of Balgie, the road leads to the entrance to the policies of Meggernie Castle, which is approached by a splendid avenue of lime, beech, elm and spruce trees, the interlacing branches of which form a vernal arch of foliage beside the river Lyon. This avenue, which is nearly two miles in length, was entirely planted by Mr. Menzies, and has thriven remarkably. It circles around the Castle, which stands about 700 feet above sea-level. Authentic measurement of some of these trees are worth recording. One of the elm trees, measured in 1883, girths 19 feet 2 inches at one foot from the ground, and 16 feet 5 inches at five feet up the stem. The lime trees in the avenue are very picturesque, and have reached a fair development, one of them girthing 13 feet 3 inches at two feet from the ground. The beeches also a very satisfactory growth. Other notable trees are the larches and scots firs, some of these having attained considerable dimensions. All the country surrounding the Castle has been transformed since the time of James Menzies by judicious planting, and presents a scene of woodland splendour, though there are still portions susceptible of improvement. The extensive estates of the Campbells of Breadalbane march with the policies of Meggernie, which have been held and greatly increased during several centuries. It used to be said that the Earl or Marquess could ride for a hundred miles over his own patrimonial domains. 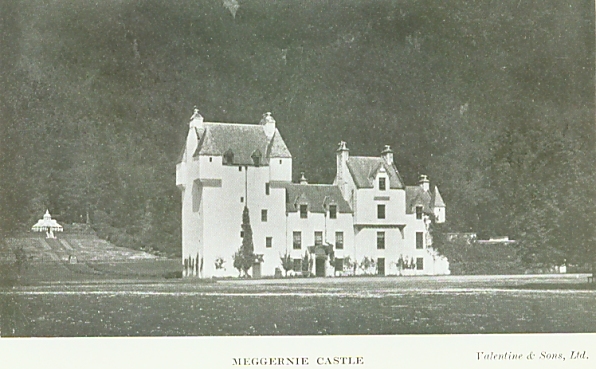 Meggernie remained in the Menzies family for centuries, but was acquired in 1884, by the late Mr. John Bullough, father of the present Sir George Bullough, 1st Baronet, who succeeded his father in 1891, and now resides at Kinloch Castle, Isle of Rhum, Inverness-shire. A few years ago Sir George disposed of Meggernie Castle and estate to Sir Ernest Salter Wills, 3rd Baronet, who succeeded his brother, the 2nd Baronet, in 1921, and makes Meggernie Castle, Glen Lyon, his Scottish residence. The Wills family have had a long and honourable connection with Bristol.